These luxury master bedroom designs are a collection of beautifully furnished rooms with a variety of styles. These bedrooms were created by top interior designers and are offered here to give you ideas and inspiration. Creating the perfect master bedroom requires a careful balance between colors, furniture and decor. Attention to color palettes is an important consideration to create a room that is both inviting and relaxing. Your own personal wants and style should be incorporated in to your design to create a space that has your own personal touch and connects with you. This luxurious bedroom in the picture above draws inspiration from period interior design styles and merges it with modern elements. It combines Gold & Silver – colors often associated with luxury. For this particular room, walls were painted in a pale blue color to lighten the heavy feel of too much patterns or gold elements often evident in period styles. Floors and ceiling are also in minimal white color to highlight the beautiful golden frames and lights. The heavy wood furniture are painted in a high-gloss finish, in a yellow shade close to gold. While the fabrics used are in a silver color, it doesn’t appear overbearing as it is devoid of patterns. Special bed frame – Luxury master bedroom’s need to come with luxury beds, the centerpiece of any bedroom. Most luxury bedrooms have a special addition to their frame such as an upholstered headboard or a carved wooden one. Some bedrooms might even have a four poster bed which users may choose to decorate with sheer curtains for that extra luxurious feel. Decorative backwall – In order to draw the eye to the centerpiece of the master bedroom, the bed itself, the wall behind the bed is usually decorated with an accent color that pops from the rest of the room’s walls. More ornate bedrooms may even opt for an upholstered backwall or using a decorative carved paneling. Foot of the bed – Further accenting the importance of the bed in this luxury space, a smaller but important piece of furniture is put at the foot of the bed making it both functional and stylish. Some things to be added at the foot of the bed include an area rug, upholstered divan, console table or storage chest. Matching bedside tables with wall sconce or lamp shade – Perfect for bedside reading and any other small gadgets that need to be the master bedroom’s occupants, having a pair of these on either side of the bed is important. Besides its functionality, pairing these tables with a pair of wall sconces or lamp shades frames the bed beautifully and continues the symmetry of the space. Chandelier over foot of the bed – A chandelier or large lighting appliance is placed at the center of the room, usually at the foot of the bed. 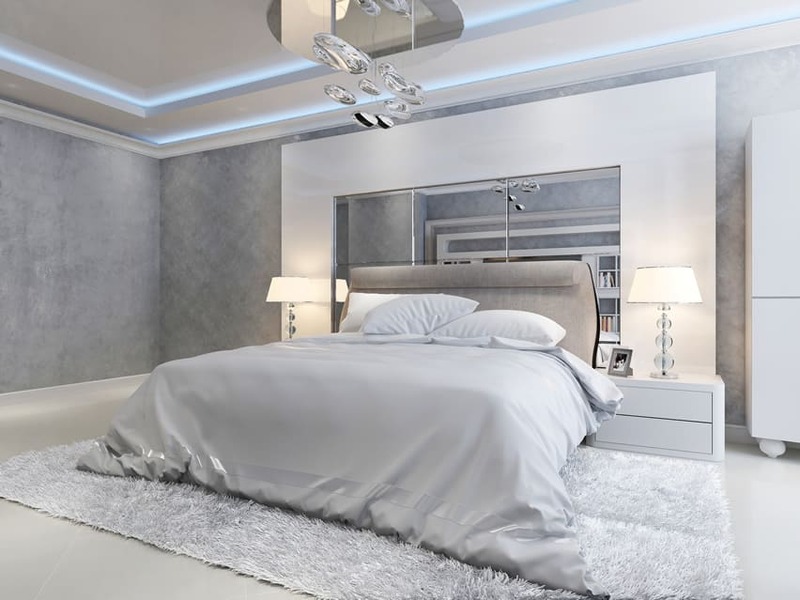 It is not very good to put this feature lighting right above the bed, but at the center of the room, to ensure symmetry and a more even distribution of light in the bedroom space. Frontwall – The front wall of the bedroom right opposite the bed usually serves a more functional purpose. A flat screen TV may be mounted on the wall, for a more modern functional feel or a fireplace with plate rail for a more traditional and warm bedroom. Another option is to have French doors leading to the balcony at this part, especially if the house features a beautiful view or is a showcase of natural light. 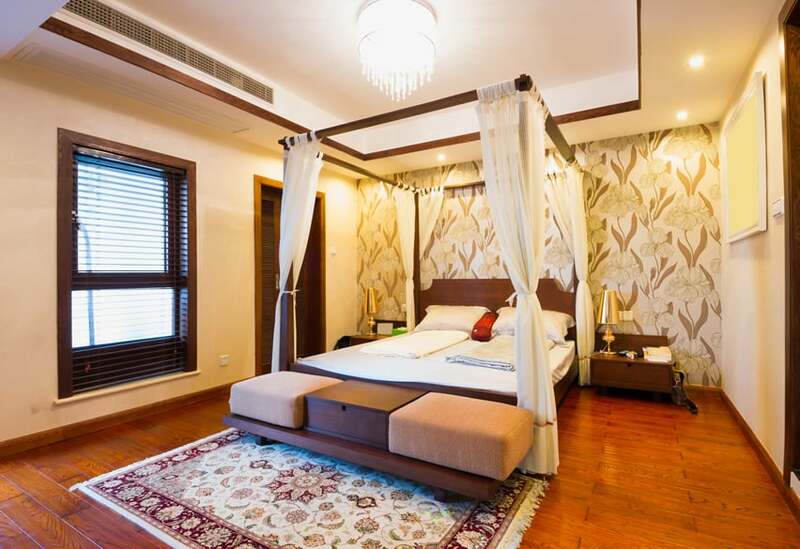 A bedroom with evident modern Asian influences, it is a combination of whites and wood tones. While porcelain flooring itself makes a statement, the star in this design would be the elevated platform bed with solid wood red Mahogany headboard against a plain white wall. Other wooden furniture items also uses the same material against a white backdrop, highlighting the beauty and quality of the wood. Sheer curtains surround the poster bed and line the windows, giving the space a softer and more welcoming appeal. This bedroom takes on an Empire style influence with its choice of Egyptian-inspired furniture pieces and classic elements. Floors are lined with an elegant cream-colored carpet, while walls follow the same color palette with simplified wall panels. 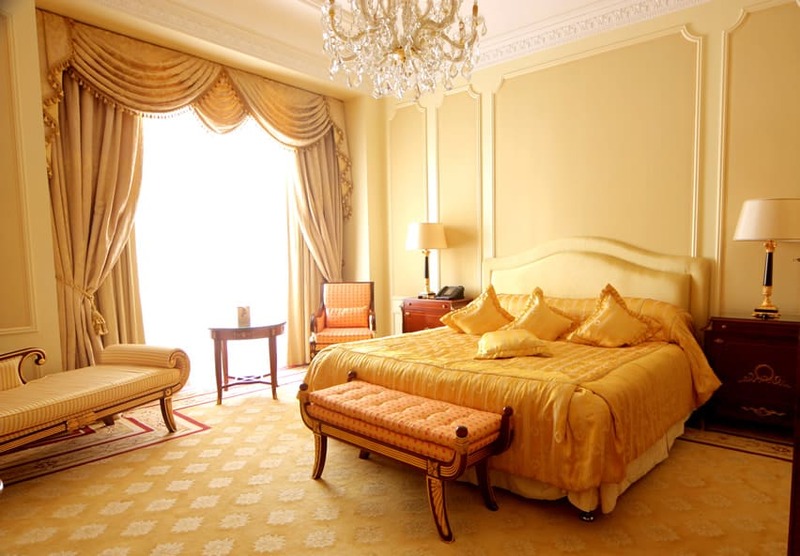 Heavy draperies in a gold tone line the windows , further contributing to the golden glow of the space, while a gold crystal chandelier hangs above the soft upholstered bed. This bedroom is rather eclectic in style, combining various classic elements like heavily embroidered fabrics and wooden furniture with modern forms and finishes. The small sitting area in the corner has obvious Chinese influences with its pair of yoke-back chairs in a red-painted backdrop. 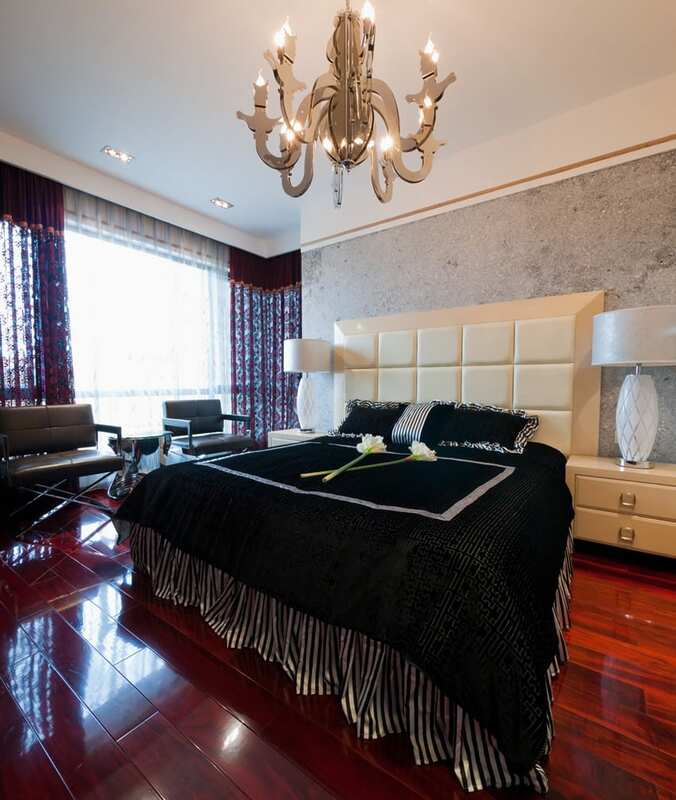 The large bed at the center on the other hand, has its headboard form inspired by art-deco. Behind it is an interesting red wall paper with golden overlays and on top of the bed are red pillows and throws with golden embroideries. The same embroidered fabric is used on the curtains, while a semi-circular dropped – an obvious contemporary element – frames the whole room. A neo-classic bedroom with a rustic appeal – this bedroom uses neo-classic forms of furniture with rustic wood finishes combined with burlap fabrics. Its appeal comes with its rustic effect, and this is further highlighted with the choice of a warm brown paint color and the light beige carpet flooring. Fabrics used have a rustic appeal, with colors mainly on off-whites. The rest of the room is kept free of unnecessary ornamentation to keep the focus on the beautiful furniture pieces. This Victorian-inspired bedroom uses not only heavily-detailed furniture pieces, but also heavy fabrics. Walls are lined with heavy brown velvet drapes from ceiling to floors, while the wooden furniture pieces has gilded carvings and velvet upholstery. 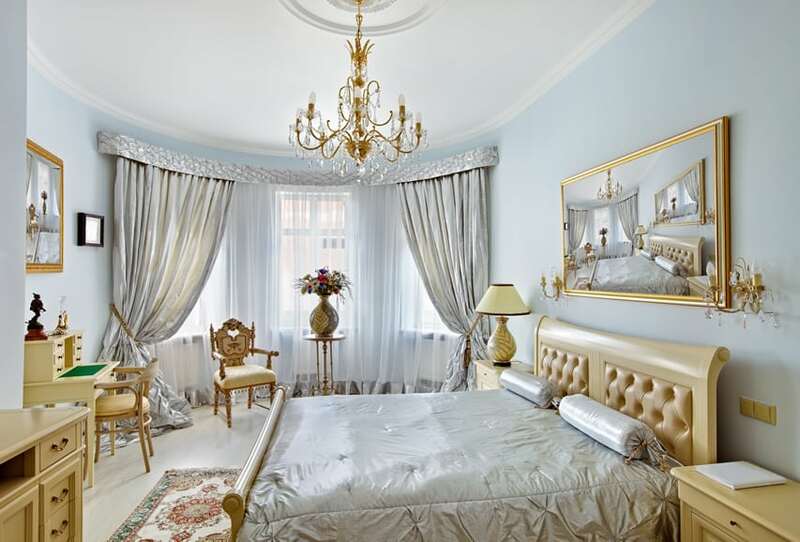 A gorgeous golden crystal chandelier hangs above the large bed while its floors are of simple cream-colored tiles. Another modern bedroom space with classic furniture pieces. Finishes are mainly modern – engineered beech wood floors, painted walls and red Mahogany accent panels. The furniture pieces are all in a wengue color with white, tufted upholstery. A large brown shag rag lies underneath the foot of the bed and floor-to-ceiling mirrors help further extend the space. In this bedroom, classic pieces are combined with modern materials to achieve this unique look. Elegant furniture pieces are painted in high-gloss plain colors, with golden details/ornamentation. The large carved headboard has feminine carvings and is painted in a pale pink color with tufted upholstery. Behind is is an accent wall with white and gold wallpaper with intricate patterns, and on its both sides are a pair of floor-to-ceiling mirrors with diagonal patterns to contrast the elegant curves of the wallpaper detail. The floors are of light beech wood, with white shag rug on the foot of the bed to give the room its nice warm glow. Another period-style bedroom with a color palette of greens and creams. Its walls are heavily detailed with painted wooden panels and pieced wood on its arched windows, while heavy fabric draping line the back wall of the bed. Furniture pieces are heavily carved with gilded details and cream-painted wood, while the fabric of choice would combined a pale shade of green with cream. Coupled with the cream-colored porcelain flooring, this whole room gives a rather elegantly heavy look, typical of classical styles. 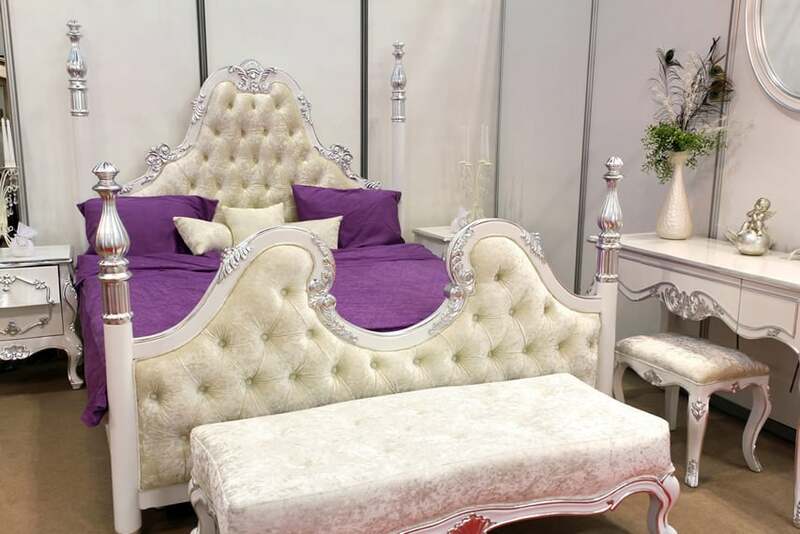 This Victorian style bedroom mainly uses whites and beige to give highlight to the royal purple bed covers. Furniture pieces are all painted white with silvered carvings/details, while the upholstery are all in a cream-colored tufted velvet fabric. Walls are also plain white, with silver-painted wood details and the floors uses light beige carpets. 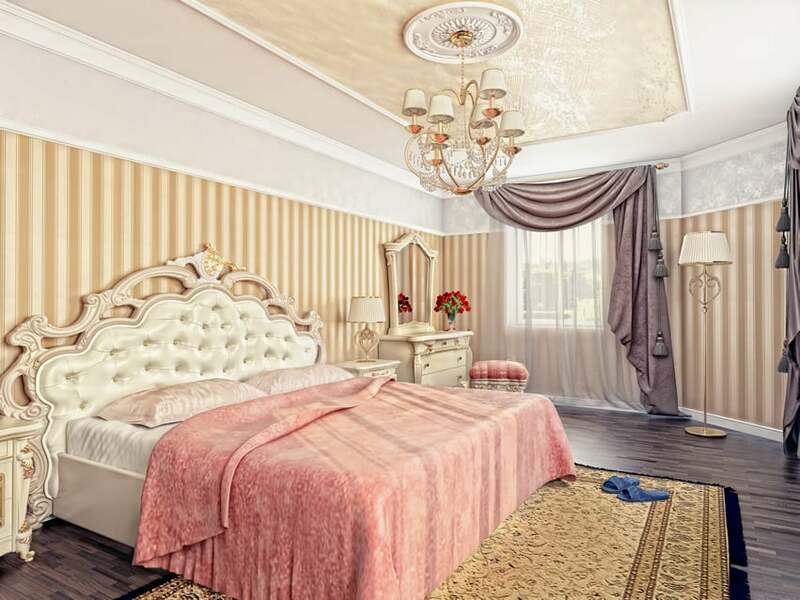 This bedroom exudes feminine grace with its choice of materials and colors. It is mainly of golds and pinks, with golden wallpapers on the walls and the ceiling and a large pink throw over the bed. The furniture pieces is in an off-white shade with golden carvings, while the upper half of the walls uses silver & white wallpaper. The sheer curtains lets in a faint glow of warm sunlight and is crowned with pink-purple toned drapes. A black and white themed bedroom with black-painted walls and black carpet floors. It uses white furniture pieces including a fully-upholstered floating bed with a pair of white nite tables with black-painted carving details. Metal pieces are in silver and even the bed covers are in silver, complemented by a black throw to help put together the look. Characteristic of this large bedroom is its massing and the light green patterns on its carpet floors, fabrics and wallpaper. The pair of columns framing the bed gives it a massive dominating appeal with a faux marble finish and silvered column capital. The walls are paneled walls with white wallpapers with intricate patterns in an understated white color, but the wall behind the bed is covered in wallpaper with green patterns, seemingly a continuation of the patterns on the carpeted floors. Furniture pieces are in off-white color with cream upholstery, while the bedsheets, pillows and window drapes uses the same green embroidered fabric. This transitional bedroom has an interesting mixture of furniture pieces and finishes. Walls and floors are kept simple – white and dark brown paint with gray porcelain tiles for the floors – to make way for the other heavier elements. The bed is fully upholstered in a brown velvet fabric with faux animal skin bed covers and throws. Furniture pieces are in dark wengue with accents in gold, glass and silver. This bedroom is all about its choice of drapes and fabrics. Walls are lined with heavy curtains – one in a brown velvet fabric, while the other has a light beige sateen fabric. The furniture pieces are gilded with silver details. 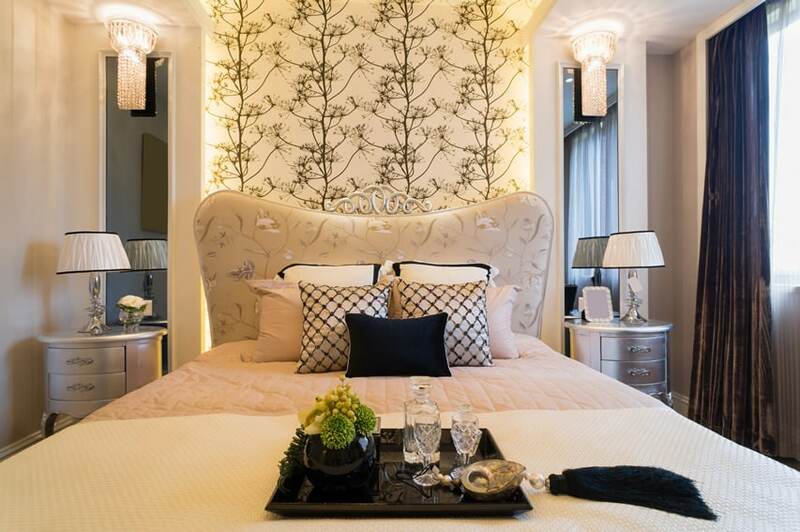 The headboard is tufted and upholstered with silk, while the large sofa is upholstered in an off-white velvet. 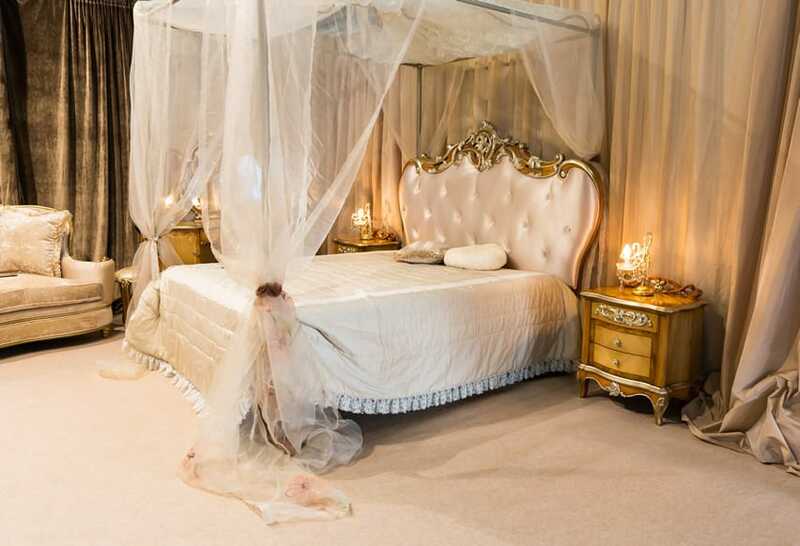 The four-poster bed is also draped with sheer white fabric. A master bedroom with a neutral palette that is universally-appealing. It has cream-colored ceramic tile flooring with white walls and a light cream accent wall. Its ceiling has exposed wooden beams in its natural Teak color with doors and moldings in the same color. The teak wood doors and windows welcomes natural light into the space, illuminating the area and making it appear brighter. 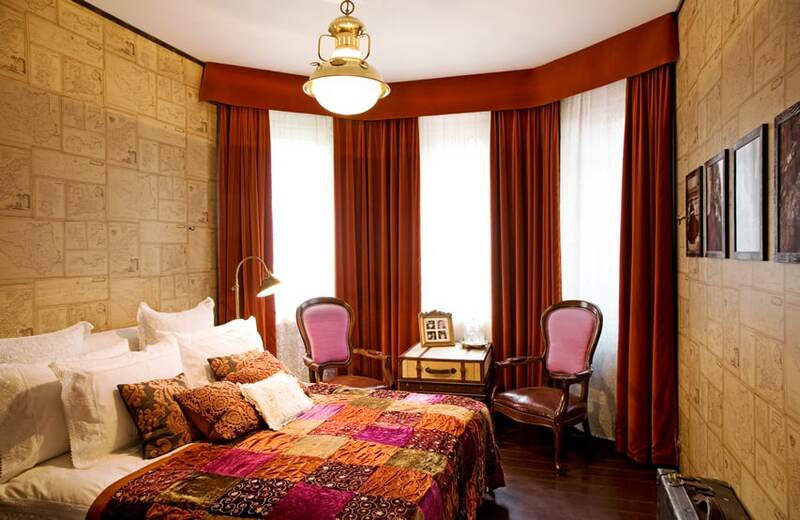 Light beige curtains were used, and for the upholstered bed and the bed comforters, a light beige fabric was also used. A pair of antique nite tables are found beside the bed, while a plant was placed in the corner of the room to give the room a more natural feel. This modern bedroom keeps a minimalist choice of color palette of cool gray and white. Walls are lined with unique gray-silver colored wallpaper while the floors uses plain white porcelain tiles. There’s a built-up wall behind the bed painted in white with panels of rectangular mirror at the center. Furniture pieces are also in plain white but the headboard is fully upholstered with a light gray fabric. 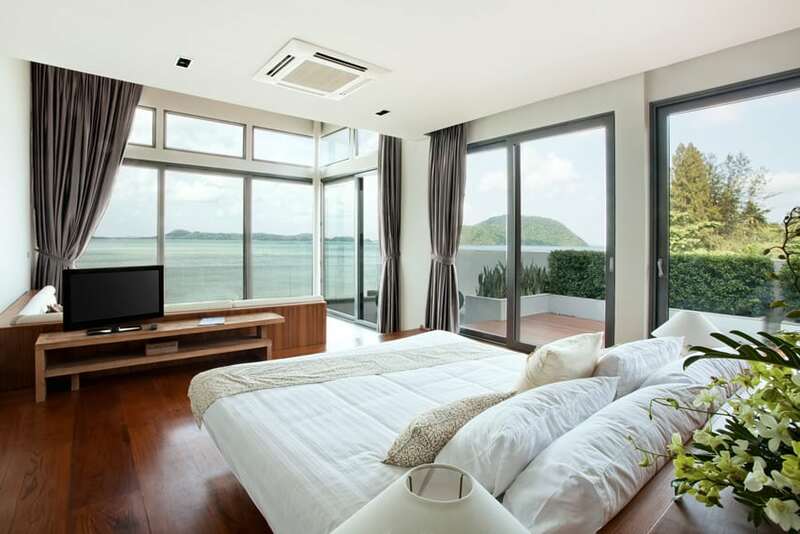 This bedroom maximizes its gorgeous view of the ocean with its large wood-framed windows. 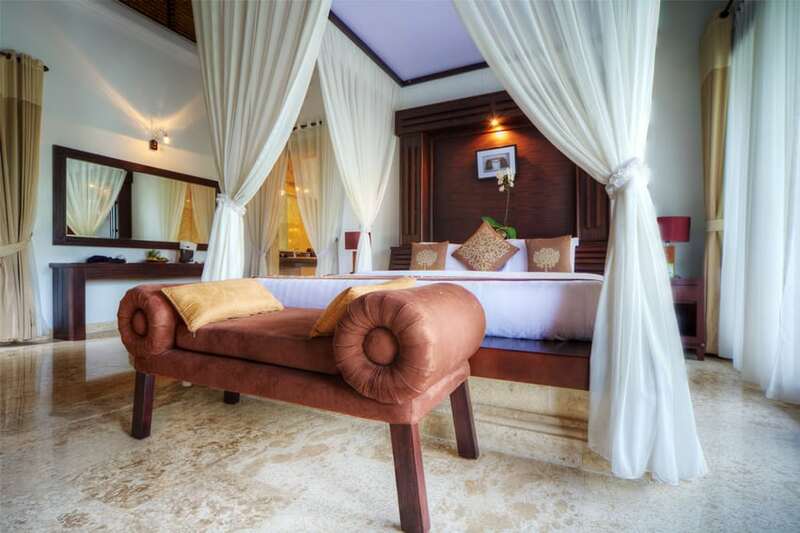 It has aesthetics typical of resorts – wooden engineered floors with wooden beds and furniture pieces. The walls are kept plain white, with an accent wall using tiles of faux stone masonry. Potted plants are introduced inside to give it a more outdoor feel, reflecting the pine trees seen outside the room. An interesting yellow-themed bedroom with an eye-catching four-poster bed. The walls of the room are painted in a light yellow color, producing the warm glow of the room. It has white ceiling and white moldings and a light beige carpet floor. The large poster bed in the middle is draped with white fabric, with golden yellow tassels on its edges, giving a Moroccan tent look to the bed. Furniture pieces is a mixture of different period furniture – a neo-classic bench with light yellow upholstery and a silvered Rococo lounge chair and ottoman with white upholstery. This bedroom is an interesting mixture of period furniture and modern elements. A pair of silvered antique night tables stand beside the bed. Behind the night tables are tall framed mirrors attached on the off-white walls, while the wall behind the tufted headboard has a wallpaper with tree patterns in black and is softly lit by warm white cove lights on its sides. A pair of small crystal chandeliers hangs above the pair of mirrors, warmly illuminating the space, while drown velvet curtains hang beside the large windows. This period-style inspired bedroom features more traditional elements and little to few modern elements. Floors are tiled with white porcelain tiles, highlighting the other more intricate elements for the room like the striped and orange wallpaper which covers the whole room. Light peach drapes frames the white windows, while golden lamps and chandeliers contribute to the room’s artificial lighting. The large bed in the middle is in gold as well, and a pair of armchairs with tufted upholstery sits beside the bay window. This transitional style of bedroom goes for the direct complementary color scheme with its subtle blue and yellow combination. Floors are laminated teak wood while the walls and the ceiling are kept simple painted in white. The accent wall behind the bed, however, is where all the details go. 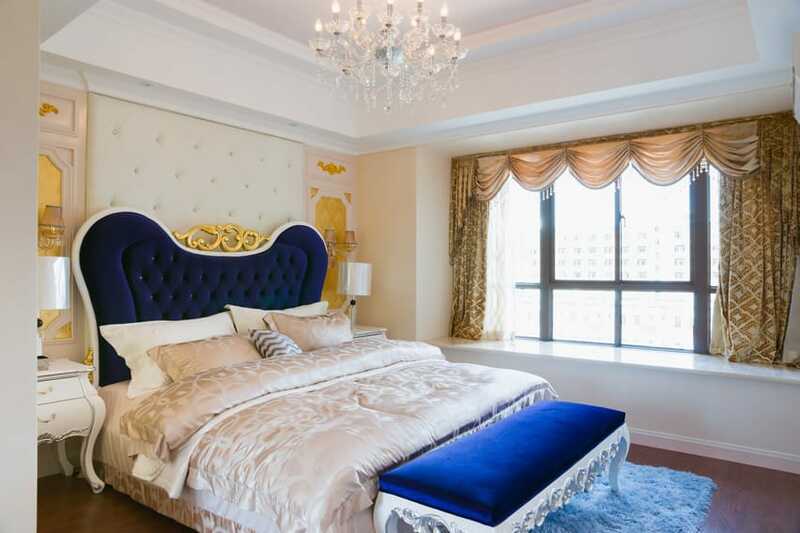 Directly behind the bed is a tufted wall with white leather upholstery, and beside it are paneled walls with center panels that are finished with gold wallpaper. 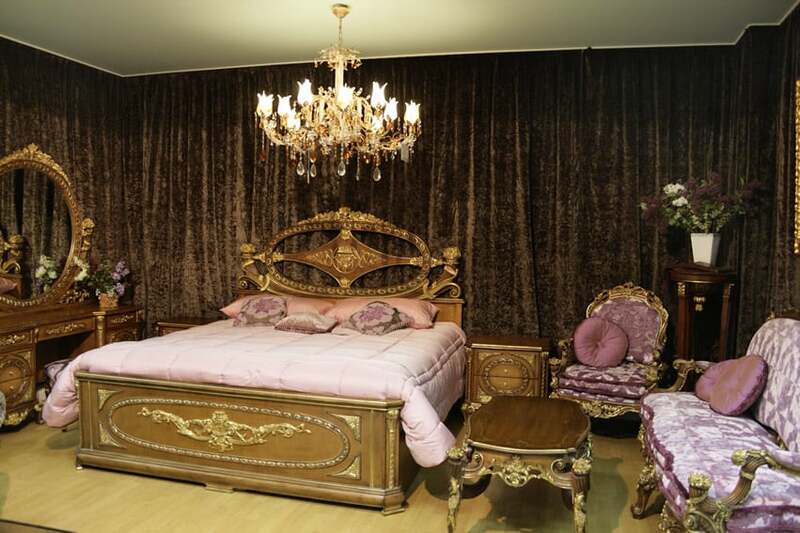 It has a pair of elegant wall sconces, white nite tables and table lamps as well. 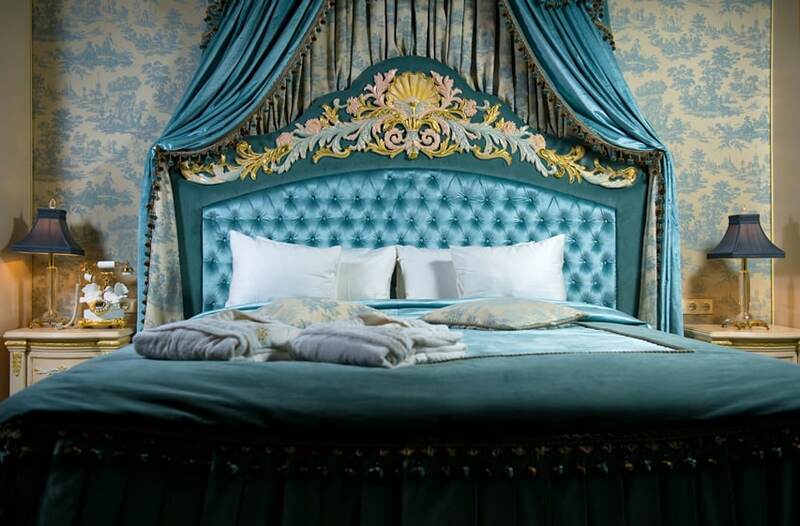 The large bed has its own tufted headboard, but with blue velvet upholstery and gilded carvings. The bench at the foot of the bed is also upholstered in blue, while the windows are framed with golden drapes. 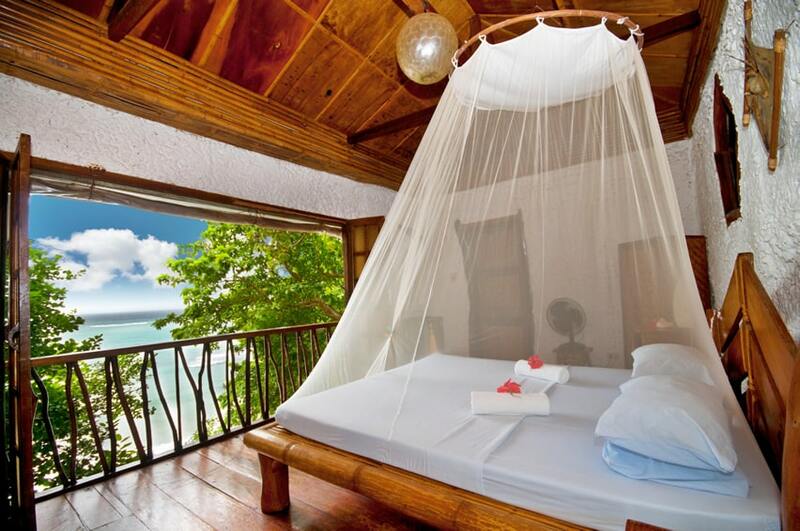 A gorgeous modern bedroom with a wonderful view of the ocean. 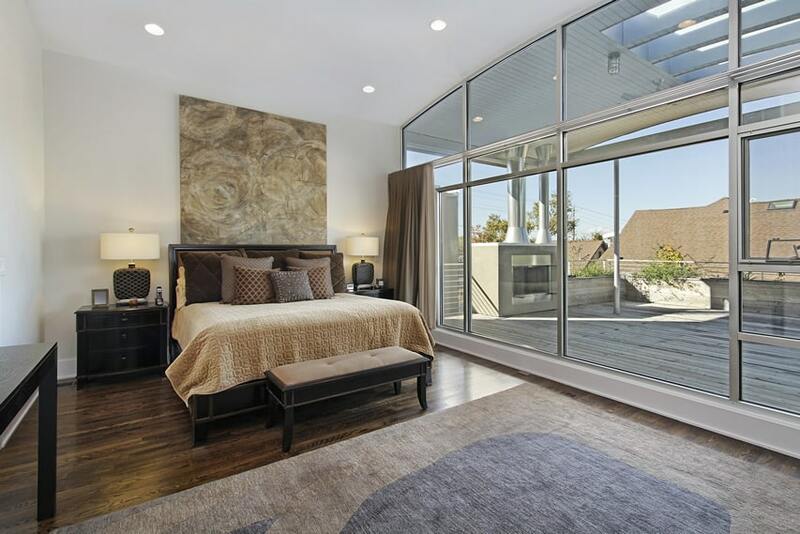 The bedroom is surrounded by large sliding doors leading to the outdoor patio. The high ceiling also contributes into making this bedroom feel more spacious. It has solid Golden Oak floors and simple white walls. The bed itself has a modern cantilevered design, giving an illusion that it floats. A built-in sectional sofa could be found at the end of the bed, on a lower floor level, maximizing the view the room provides. 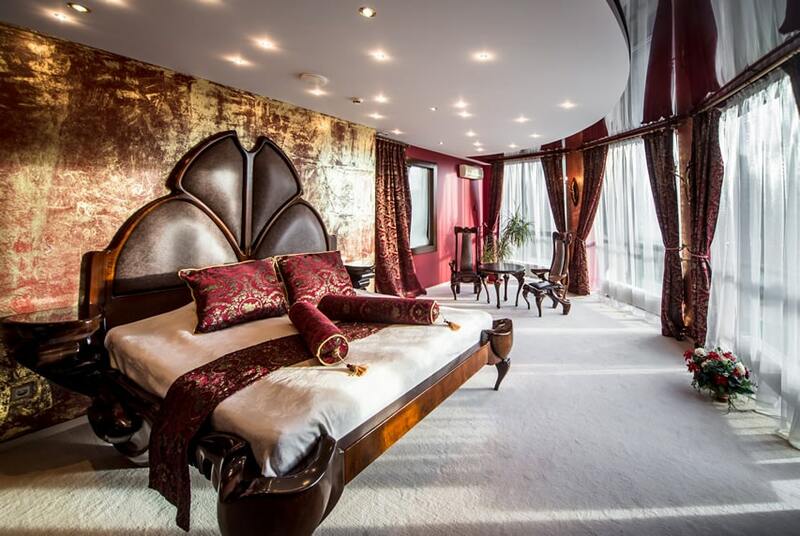 This bedroom has interesting combination of finishes. Starting from the floors, it uses ceramic tiles faux red mahogany finish, while the wall behind the bed has a rough concrete finish. This is combined with a modern bed which has square tufted cubes and a piar of white nite tables and table lamps. The large windows are lined with sheer curtains in white and red, while the sitting area uses a pair of modern chairs with beige leather upholstery and stainless steel framing. A luxurious period-style bedroom which uses distinct and intricate patterns and bold teal color. Most notable is the large teal bed with teal bedding and white pillows. It also has a tufted headboard with sateen upholstery and carvings at the arch of the headboard painted in gold, pink and light teal. The wall behind the bed has a cream and teal wallpaper with a landscape design. This design is also seen on the lining of the teal headboard canopy of the bed. This very large bedroom mainly uses light cream and whites to contribute in making the space appear bigger. It uses white textured ceramic tiles for its floors, and Italian sandstone tiles for the fireplace column. The rest of the walls are painted in a marbled light cream color while the ceiling and its moldings are all in white. Window drapes used are also in cream, while the other upholstery and other fabrics are also in the shades of creams and beige. The sleigh bed is finished in dark wengue, while the other furniture pieces are all in a polished Mahogany finish. This luxurious bedroom has very interesting headboard details. While most of the walls are painted in a dark mocha brown color with matching dark brown porcelain tiles, the accent walls uses gold upholstered tufted panels, framing a smaller section which uses pieced gold metal accent piece. 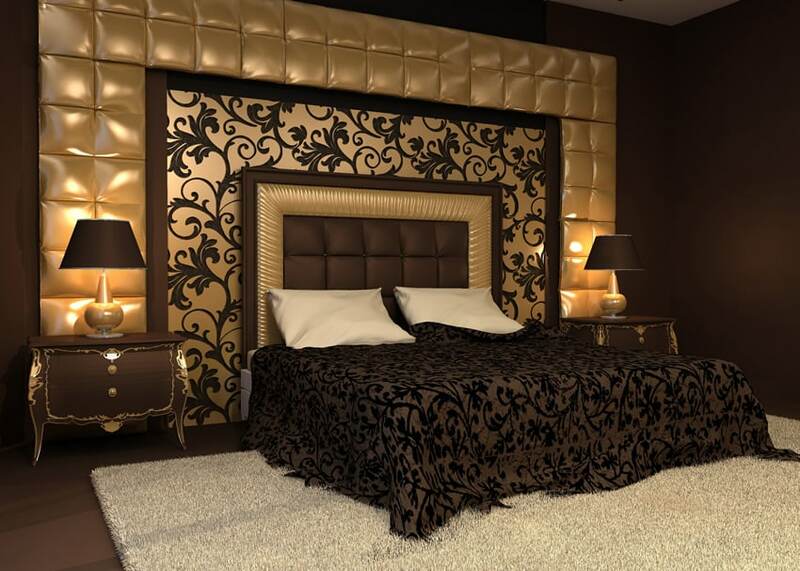 The headboard itself is framed with wengue wood with a mixture of gold and tufted brown upholstery. To help brighten up the space, a large cream-colored rug lies beneath the foot of the bed. 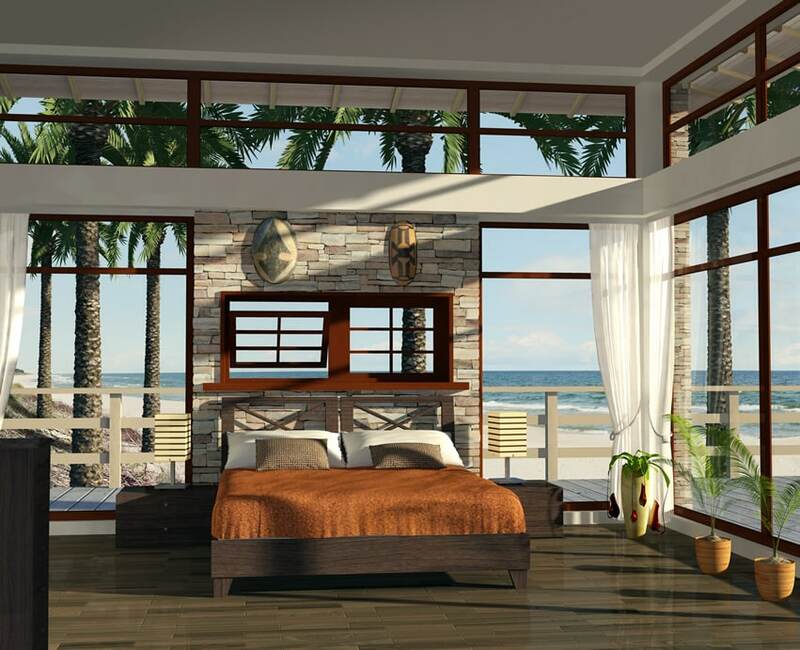 A tropical-style bedroom with large windows which opens to the view of the sea. Its walls are of white stucco, while the floors are of solid Mahogany. The doors, windows and even the railings and balusters are also in solid Mahogany, while the bed uses simple varnished bamboo framing. It has a solid Mahogany headboard and sheet white canopy to protect the user from insects. This bedroom uses a cool color palette, giving it a light, easy-on-the-eyes feel. Walls are of a gorgeous light turquoise paint with white moldings and French doors and windows. The fireplace uses beige stones, while the floors are of Red Oak planks. The side chair beside the fireplace is upholstered in a gorgeous floral pattern in light turquoise, gold and cream. The poster bed uses wengue finished solid wood framing and the assortment of throw pillows uses a combination of light turquoise, white and metallic bronze. 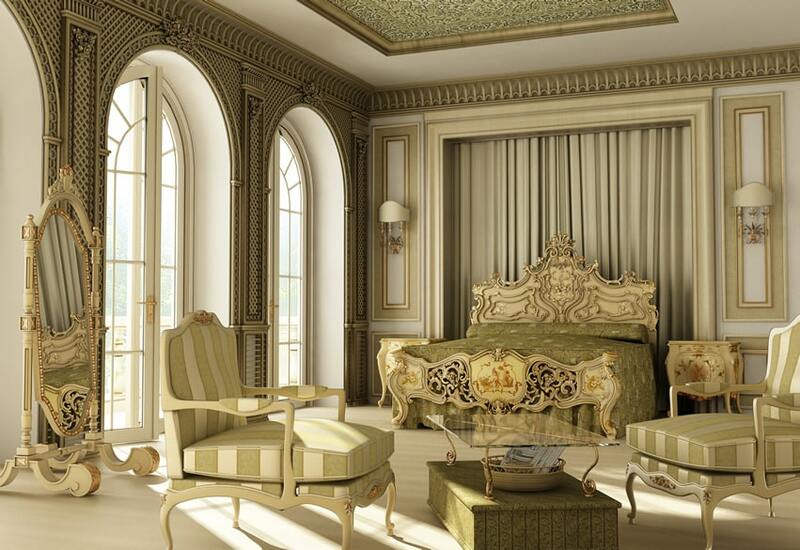 The ornate and exuberant detailing of this bedroom is very reminiscent of Baroque style of interiors. Ornate details can be found on its walls, furniture pieces and it also has a heavy choice of fabric and dark colors, all characteristic of Baroque style. 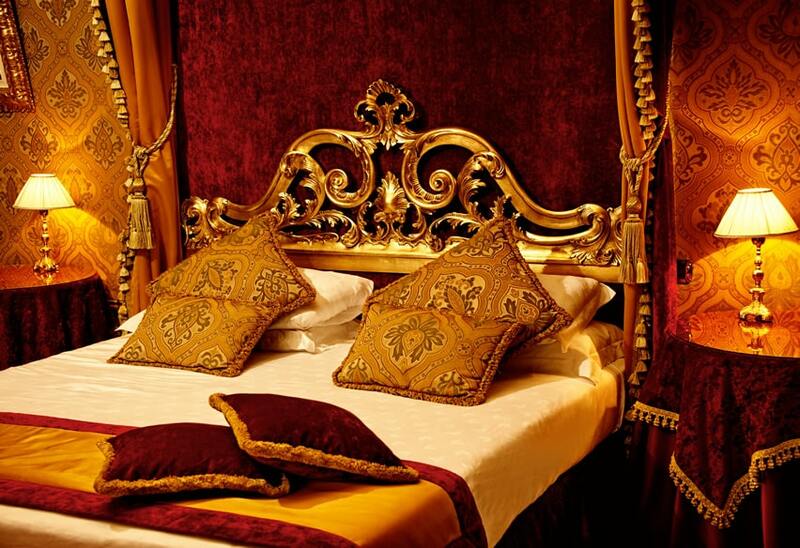 It has yellow gold wallpaper with intricate patterns, and against it, dark red velvet fabric directly behind the gilded carved headboard of the bed. Drapes framing the bed are also in red velvet with yellow gold lining and gold tassels, while some throw pillows have the same pattern as the wallpaper, and some also uses red velvet fabric. This bedroom has a dainty, feminine appeal with its cream and white combination. All furniture pieces are in white, while the floors uses diagonally-arranged Beech wood floors. Accessories are in gold (like the pair of table lamps), and even the patterns on the fabric of the window drapes are in gold. The wallpaper behind the bed uses a cream color with metallic cream pattern, and to soften the over-all look, a light sheer fabric acts as canopy to the bed and as sheer cover to the windows. This eclectic bedroom features various design styles and aesthetics and blending it into one unified bedroom design. 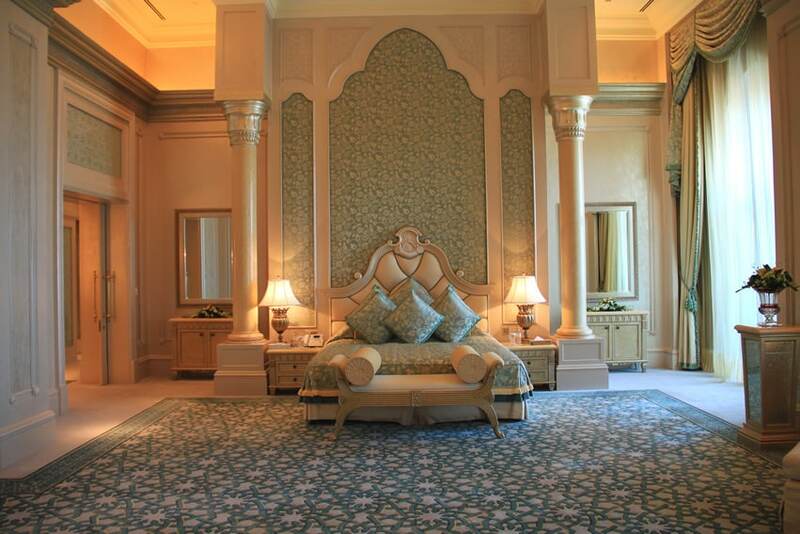 Most noticeable would be the West Asian quilt on the bed combined with embroidered fabrics of the throw pillows. Beside the bay windows is a pair of antique Fauteuil with plain pink upholstery and a side table made out of stacked vintage luggage. The walls are lined with beige tile pieces which features maps of different countries and cities, further supporting that the bedroom’s design is inspired by the travels of its user. Another eclectic bedroom design with beautiful Maple wood flooring. The walls uses textured wallpaper in a combination of light cream and orange-toned brown. Furniture pieces uses zebra wood in piano finish with gold metal accents. The ceiling itself also features an unusual high gloss finish, while the large area rug is in a beige faux croc skin. This modern bedroom has a small space, but still uses large and domineering furniture pieces. The bed is fully upholstered and heavily tufted using white faux leather. While the floors are understated very light faux beech wood finish ceramic tiles, the walls feature panels with purple velvet fabric framed with stainless steel. Bedding and pillows are also in various shades of purple while the geometric area rug is in a gold color. Minimalist Asian interiors combined with floral elements which can be found on the accent wall paper and the traditional area rug. Walls are simple, painted in a plain, off-white color, with natural wood finish moldings, door and window frames. The four-poster bed is in wengue finish, and sheer white fabrics drape on the bed columns to soften the look. Beautiful modern interiors which highlights the natural beauty of the wood finishes of the room. Walls and ceiling are simply in plain white with large stainless steel-framed windows which opens to the outdoor patio. The floors are of gorgeous Walnut planks with wengue-stained wood furniture pieces. 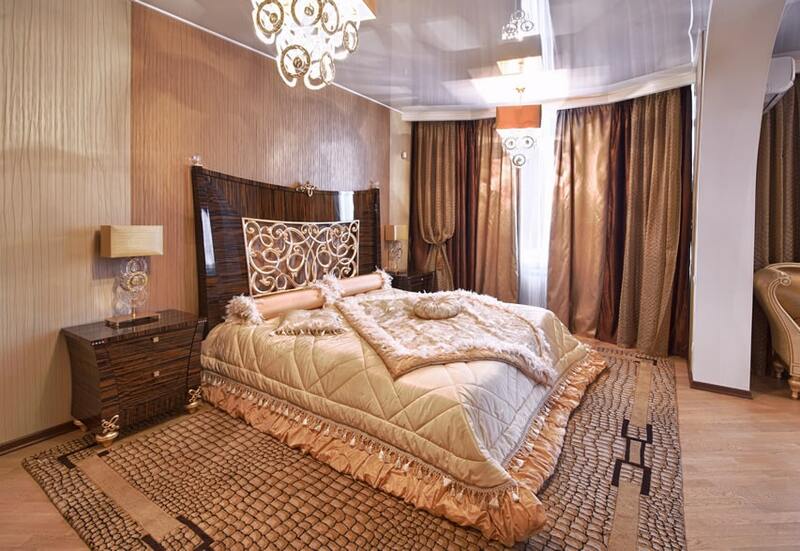 It has a large beige artwork above the headboard and uses flatweave area rug and brown bed covers. The medley of browns of whites is a wonderful combination which highlights the beauty of natural materials. This bedroom boasts of large windows and feminine sinuous lines on its furniture pieces, giving it an overall dainty appeal. Walls are painted in a light cream color, with white moldings and white ceiling, while the doors & windows are wood-framed. Sheer white fabrics were used for the curtains, and a cream-upholstered valence board sits on top of the windows. For the floors, it uses beige carpet with small continuous patterns. The large bed in the middle has tufted headboard with cream-colored upholstery and a pair of dark walnut side tables. The chair at the foot of the bed has upholstery with medallion patterns, in a metallic fabric. The color combination and choice of fabrics, forms and patterns create the overall feminine silhouette of this bedroom. This modern bedroom has a dark, mysterious and masculine appeal with its choice of dark colors. The room is well illuminated, with large sliding doors letting in sufficient natural light, as well as enough artificial light, featuring cove lights, pin lights and chandeliers. The flooring is uses ceramic tiles in faux dark walnut finish, wine-red upholstered rectangular wall panels and dark brown sheer curtains. The bed and the side table combines dark walnut wood with silver laminates with engraved patterns. The bed also features tufted headboard with black upholstery and deep purple bed sheets. To lighten up the space, a large silvered bench sits at the foot of the bed and white sheepskin drapes over the bed. 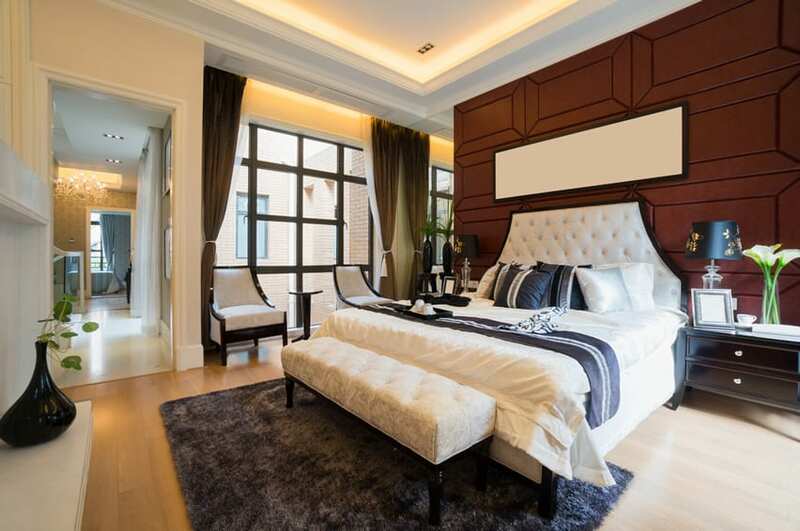 Luxury master bedroom designs should be inviting and make you feel at home. This simple bedroom which is sparsely decorated still evokes a luxurious charm. While the room uses simple black ceramic tiles with white walls and white sheer curtains over the large windows, the classic furniture pieces stands out in this modern backdrop. 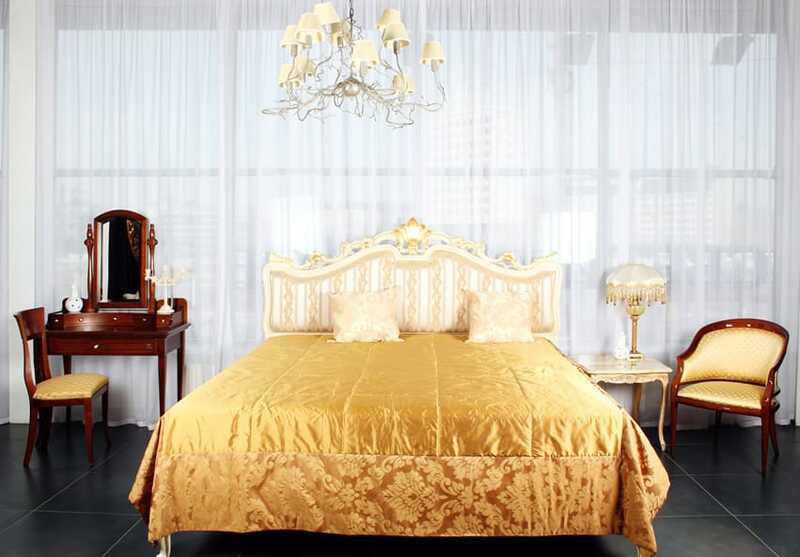 The bed is large with white-painted framing, golden carving details and metallic upholstery on its headboard. The chairs and the vanity are antique walnut and the fabrics used are of yellow gold, giving it a regal appeal. 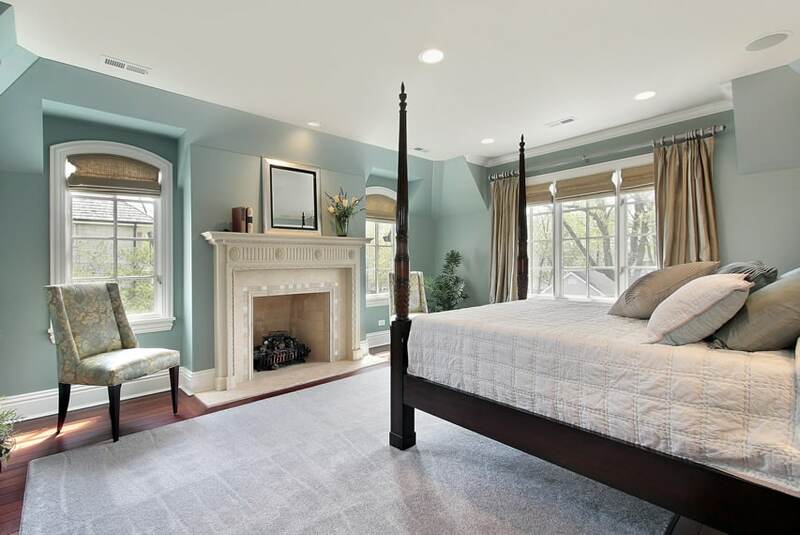 A quaint mezzanine bedroom which uses modern finishes and an interesting layout. Floors uses gray carpet with white walls and dark gray accent divider wall. The bed stands out from the dark floors as it is fully upholstered in white leather, and interestingly, a freestanding bathtub stands beside the bed, with light cream tiles beneath and surrounding it. Behind the accent wall lies the toilet and the wash area for privacy with only the modern railings to separate the mezzanine bedroom floor from the rest of the other rooms.